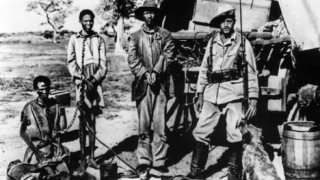 Will Germany Ever Recognize The Namibian Genocide? Home Africa Will Germany Ever Recognize The Namibian Genocide? AFRICANGLOBE – In April, Germany recognized the Armenian genocide. Germany, as the former colonial ruler of Namibia, has however not yet recognized the murder of tens of thousands of Namibians as a genocide. Many say the time is ripe. On June 2, a group of German parliamentarians, led by Dagmar Freitag of the Social Democrats (SPD), will visit Namibia to meet MPs, civil society representatives and Namibian academics. For Israel Kaunatijke, a Herero living in Berlin, this is a chance to revive the discussion over the Namibian genocide. Germany, he says, should finally recognize that the slaughter of the Herero, Nama, Damara and San peoples of Namibia was in fact a genocide. The calls for an official recognition of a genocide has grown even stronger after the German parliament or Bundestag recognized the Armenian genocide in April this year. “They don’t take our issues seriously, that is discriminating and disrespectful,” Kaunatijke said. For years, his initiative “No amnesty on genocide” has been lobbying for the recognition of the crime against his ancestors. 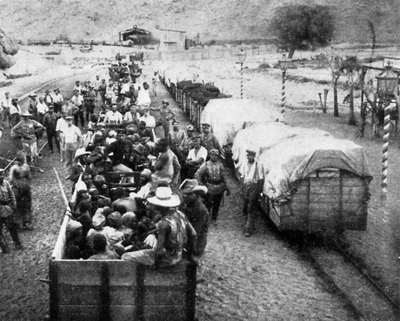 According to the UN, German troops committed the first genocide of the 20th century in Namibia which was then known as German South-West Africa. In 1904, the German general Lothar vonThrotha used an uprising against the colonialists as pretext to slaughter around 70,000 Hereros, which amounted to about 80 percent of its population. The troops also wiped out half of the people of the Nama ethnic group. The UN officially called the killings a genocide as early as 1948. But Germany refuses to do so to this day. In 2004, Heidemarie Wieczorek-Zeul, Germany’s development minister at the time, took first steps to acknowledge Germany’s brutal role in Namibia. She attended a remembrance service in Namibia’s Waterberg and asked for forgiveness through a joint prayer. An official German apology was however not part of the package. The German Bundestag has seen several attempts to demand such an apology, Wieczorek-Zeul said. In 2012, the Social Democrats party (SPD) and Green party tabled a proposal to officially recognize the genocide. In response to this, the German government stated that the UN Convention on the Prevention and Punishment of the Crime of Genocide of December 1948 could not be used retrospectively. Germany, the government argued, had moreover repeatedly admitted its part in the Namibian killings, offered continued cooperation and support to the Namibian government and was doing enough to compensate the victims. According to Kaunatijke, this however was not an admission of guilt, nor was it the deserved apology. With the recent discussion over the Armenian genocide, the timing for a renewed debate could not be better, says ex-minister Wieczorek-Zeul . “You cannot just always ask others to recognize their guilt. You also have to admit your own guilt and give things their proper name,” she said. “There is finally a real movement” which could lead to a renewed proposal in parliament, says Kaunatijke. On May 7, Germany’s first member of parliament of African origin, Karamba Diaby (SPD), called for a proper reflection on this chapter in history and for its place in German school and history books. ‘Apology now’ read the posters during a protest during the repatriation ceremony at Berlin’s Charite. Besides recognition, compensation should also be up for discussion, says Kaunatijke. Wieczorek-Zeul agrees. Germany’s reparation payments to the Namibian government are not specific enough, she says. “The people in the affected regions must be reached and their standard of living must be improved,” she argues. Today, many descendants of those murdered and displaced live in what is today Botswana, South Africa and Angola, Kaunatijke explains. They should be able to return to their homelands and receive compensation for losing their land. According to Kaunatijke, Germany also ignores the fact that it carried out ‘racial research’ on the Herero. At the time, the ‘German Reich’, as it was then known, shipped the remains of deceased or murdered Herero to Germany for anatomical research. Around 3,000 bones are still stacked away in the archives of German museums today. Germany repatriated several bones and skulls back to Nambia in 2011. According to Wieczorek-Zeul, this was however conducted in an entirely ignorant and insensitive manner by the German government. The event which took place at Berlin’s Charite hospital, was attended by Cornelia Pieper, the former Minister of State of Germany’s foreign office. Pieper, who also failed to voice a proper apology, was booed by the audience. In a second handing-over of remains in 2014 the ceremony was consequently confined to a much smaller audience.